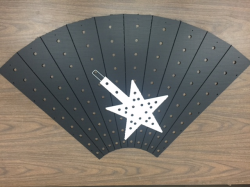 Based on Derek backus’ design of his MiniTree made of steel, we have adapted his design to a cost effective coro version. 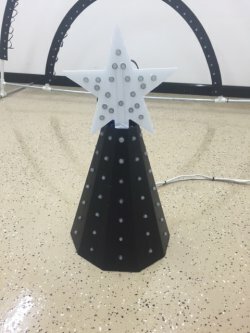 The Medium Version of Derek’s Dalek MiniTree uses 10 panels with 10 Pixels/RGB nodes for a total of 100 nodes in a 360 configuration. You can install as many or as few nodes as you like. The tree also includes our 9″ 20 node star that is held in place with two nodes. The inside of the tree has the score marks for folding. Install pixels or RGB nodes of your choice. Take the star and install the metal reinforcement rod if it isn’t already installed, make sure it is in a channel that doesn’t obstruct a node mounting hole. 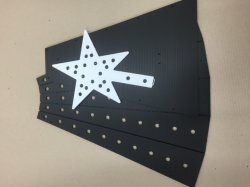 Then bend the star mounting tab slightly just below the star to make it straight when the tree is complete and it keeps the reinforcement from falling out. Make all wire connections now. When you are ready to close the tree, install the cableties loosely until you have them all in place then you can tighten them up to make the tree close.